As a CME director, you’re passionate about delivering the best possible educational experiences to your learners—and you’ve marshaled all of your resources to do so consistently. The most important element in your arsenal, however, isn’t your dedicated team or even your closely guarded budget—it’s your CME course data. Why? Because CME course data powers CME program success—allowing you to make data-driven decisions about how to allocate resources, fine-tune curriculum design, and even pivot marketing strategy to reach new audiences. In this post, we’ll show you the data that matters most and how that data can empower you to improve educational experiences for your learners and ensure that your program is on the path to achieving your CME mission. In the absence of CME course data, you’re making guesstimates, not assessments. Without an accurate portrait of learner knowledge gaps and post-activity outcomes, your curriculum design—and long-term strategies for improving learner experience—will be flawed, at best (and damaging to your program’s prospects for success at worst). Before we dig deeper, let’s define our terms. When we mention CME course data, we don’t mean the low-hanging fruit— simple statistics on the number of students and how many courses they’ve purchased. While this data is essential (and pretty easy to collect manually), the course data that matters most to CME directors is far more rich and varied. Critical CME course data connects the dots between learner behaviors, educational activities, and positive (or negative) educational outcomes. This data requires a deep dive from aggregate statistics (like how many new registrations you receive each year) to granular insights (such as which medical professionals are registering for specific courses experience low assessment results at certain points of an activity). However, access to fresh, relevant course data is just the first step in developing solutions for CME management challenges. Understanding which CME course data matters is essential to creating an accurate assessment of pain points for learners and other barriers to improving course outcomes. Critical data is all about pattern recognition. That means looking at the nature of connections between CME activities and learner outcomes— finding enough supporting information to allow you to make a well-documented assessment of what’s right and wrong with your CME program. Here are three tips to bear in mind as you think about the value of your CME course data. Provides context. It will help create an overall portrait of your program’s current and past learner outcomes. Illustrates dependencies. Looking at this information should give you insight on relationships between dependent variables, such as changes in curriculum and better learner assessment performances. Enables projections. Your data should provide a comprehensive history of course information, allowing you to quickly view the rates of positive or negative changes in learner outcomes. There’s no way around it: course data is the richest resource of insights for CME directors. It allows you to assess and solve pressing issues with program operations and less-than-optimal learner outcomes. But you can’t take advantage of all of those rich insights if you can’t quickly get access to the right data to begin with—or if your team is doomed to spend days or weeks compiling information that may or may not be relevant. Even if you already have a good amount of data about your learners that you’ve collected manually, is it really the information that you need right now? How well do your learners perform on assessments at each point along the course? This data reflects how well your activities are adapted to the specific needs of your learners. Insights gained from this data will provide guidance on how to transform your curriculum design To improve learner outcomes over time. As changes are made, learner performance should improve. If they don’t improve significantly, you’ll need to find out why— quickly. If you can’t view and compare real-time and historical assessment data after you have changed course content, you will have no way of determining if your content adjustments will have a lasting, positive impact. How engaged are your students? Course completion rate data is useful, but it isn’t enough on its own to provide the insights that you need to improve the appeal of your courses. You’ll need to know when during the timeline of an activity your learners are dropping out as well as how responsive they are to your efforts to get them back on track–as emails. This will help you to identify not just the point in a course that may be causing your learners to lose interest, but it also will give you insights as to why they aren’t staying engaged. How are your students interacting with your LMS? For example, if your learners are frequently pausing an activity and coming back hours or even days later, there may be an issue with your content—it could be too challenging or just too easy to stoke their interest. If your learners are frequently contacting the help desk and/or spending significant amounts of time on the site without starting an activity, there is likely a considerable design or technical issue with your LMS. These are just some of the learner behavioral data that will help you pinpoint areas where your CME program may be failing your learners. How well do you know your students? More likely than not, you already have a significant amount of demographic data on your program participants. While information such as their medical specialization and years in practice is a good starting point for analyzing how well your CME program is fitted to your learner’s needs, it isn’t enough to help you really understand educational outcomes. To do this, you’ll need to be able to segment your data according to relevant criteria and then analyze the patterns within the data. For example, if a large number of students with more than 10 years of experience in their field drop out of a course at a certain point, this may reveal that it is failing to engage experienced learners. In that case, your curriculum may be due for some adjustments. As we’ve seen, the sheer amount of data generated from even a single activity can be intimidating. There are pre-activity and post-activity assessments, course completion rates, and learner feedback data just for starters. Adding to that are other critical data—such as demographics, learner feedback, and knowledge retention data—which will give you insight into your CME program’s ability to meet its goals. 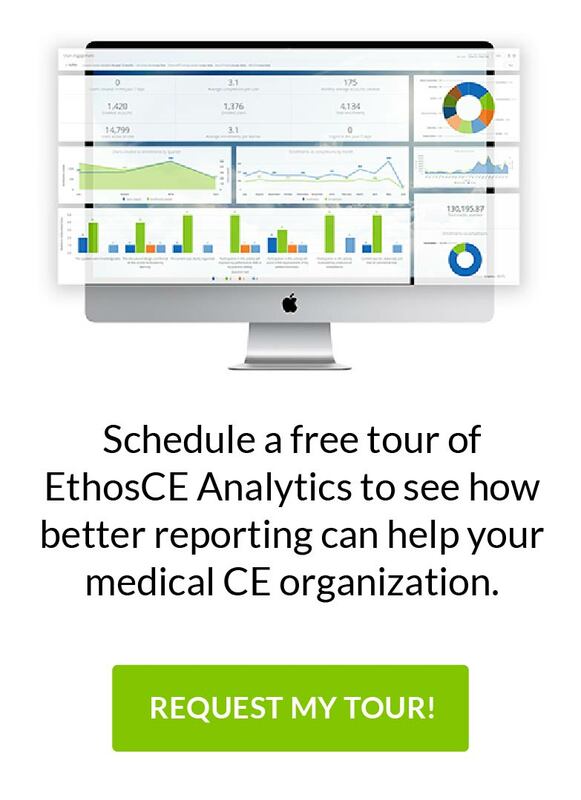 If you aren’t prepared to devote the time and human resources on a massive overhaul of your data collection process—and a painstaking review of all of your past and most recent CME course data—to get the insights that you need, you’ll have to find an enterprise-grade CME management system. Data is presented in a series of customizable dashboards which auto-generate easily shareable data visualizations. That means no more squinting at spreadsheets or wrestling with that scientific calculator. You’ll be able to see not just aggregate and individual CME course data, but also the critical patterns within that data that yield the actionable insights necessary to grow your CME program. Most importantly, EthosCE Analysis manages that data for you. That means zero risks of human error and instant, painless data visibility. Connect with us to find out how to make your data work for you.